In three of the books the teacher supposed to provide instruction against the Dark Arts turns out to be pretty nasty. 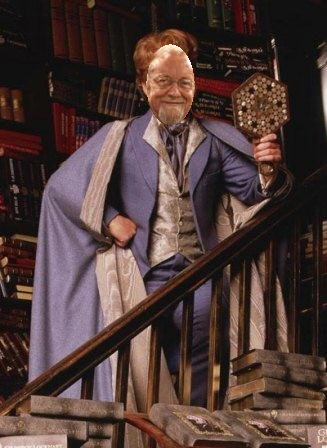 One of them however is simply a gullible self-promoter called Gilderoy Lockhart. His opinionated flamboyance was similar to that of Gareth Evans, who first tried to make waves in Sri Lanka in 2007 by suggesting that other countries should interfere in Sri Lanka. In invoking the doctrine of the Responsibility to Protect, while also putting himself forward as the Lord Protector, he suggested that genocide and ethnic cleansing were occurring in Sri Lanka. He did this with no idea of what he was talking about, as he admitted when he asked his speech writer what was meant by ethnic cleansing. The answer was the LTTE expulsion of Muslims from the Northern Province in 1990, though anyone listening to Gilderoy Evans or reading his text would have assumed he was talking about recent events. 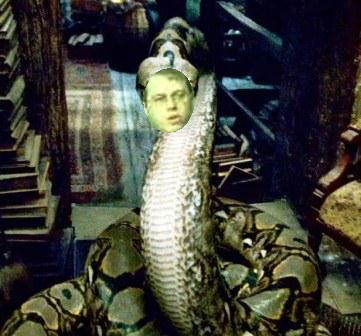 Nagini went around delivering death to all those Voldemort wanted to get rid of. These included Severus Snape, who had done his best to help those opposed to the Death Eaters whilst keeping the trust of these latter. His predicament was in a sense similar to that of Ban Ki-Moon who, though he has often been suspected of wickedness by those fighting terror, had good reason for his circumspection. We must remember though that Snape did his best to protect Hogwarts, no easy task towards the end when Death Eaters had been placed all around him. 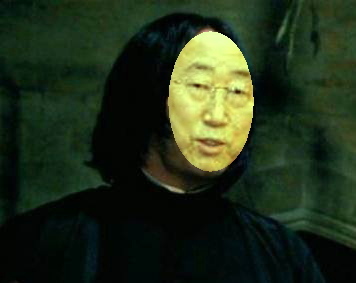 Having had to cope with Navanethem Pillay and Louise Arbour and Martin Lee, Ban Ki-Moon must know exactly how Snape felt. 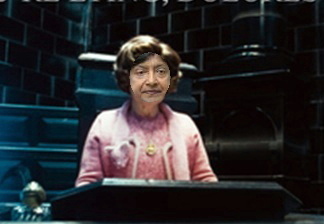 However, with the support of heads of the old agencies, such as those of UNDP and WHO and ILO (Juan Somavia indeed looks a bit like the gentle giant Hagrid), one hopes good will triumph in the end, and that Ban Ki-Moon will not be sacrificed by Nagini Keenan in his push for regime change all over the world. Given the desperate efforts of Jon Snow at Channel 4 to present lies and half truths as evidence of allegations he has concocted, I need hardly comment further on his resemblance to Rita Skeeter. But I should note that J K Rowling leaves it open as to whether Rita is simply an amoral journalist willing to do anything to grab attention, or whether she has more sinister motives, to which she has been brought by the emphatically wicked. 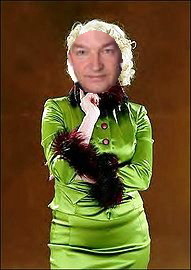 Whether wicked or not, Snow certainly resembles Rita Skeeter in other ways. I was reminded of her preposterous costumes in reading the British Sunday Times characterization of his ‘comic ties and jocund socks… It is a pathetically and worryingly childish pose in a man approaching retirement’. Who then are the people Snow is providing an outlet for? I have no doubt LTTE personnel are amongst those who have fed Channel 4 information, along with Sri Lankans of all groups who like Alan Keenan want regime change. 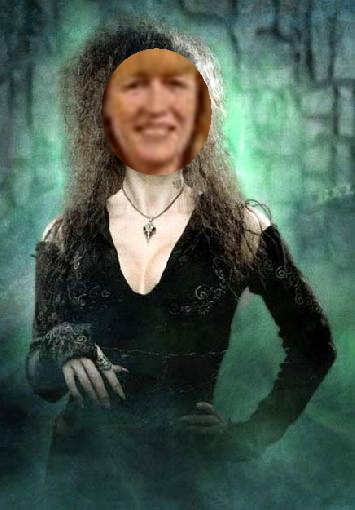 But most insidious of all are the old Channel 4 patrons in the form of the last Labour government, with its now open champions such as Joan Ryan of former – and no doubt future – terrorists, crudely and unashamedly partisan like Bellatrix in the last few Harry Potter books. It was Channel 4 after all who questioned the Lancet’s account of 100,000 civilian deaths in Iraq by claiming, on October 29th 2004 if I have it right that ‘without bodies can we trust the body count?’ This is very different from their bald assertion, with no evidence at all, that there were 40,000 civilian deaths in Sri Lanka. But the reason for these double standards was made evident by the note in the New Statesman on November 15th 2004 I believe which said ‘Channel 4 delivered a hatchet job, based on Downing Street briefing’. Tony Blair may have been responsible for many of the excesses and the cover-ups in Iraq, but he was certainly ably assisted in the latter period by his preferred successor David Miliband, who seems now to be the prime mover in the effort to resurrect the LTTE. Miliband looks rather like Barty Crouch, who escaped from Azkaban in the guise of his old mother, and subsequently imitated Mad-Eye Moody as the Professor of Defence against the Dark Arts. His venom when he is found out makes clear the nasty inner nature of the cherubic youth who kept changing character. 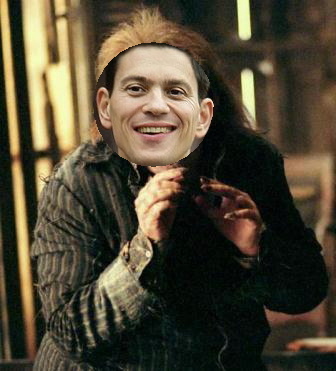 David Miliband’s latest outburst about Sri Lanka however suggests a more weaselly nature than that of the relatively passive Barty Crouch. In his effort in 2009 to save Mr Prabhakaran, his determination to take revenge on Sri Lanka through the Special Session of the Human Rights Council which he declared was to do with War Crimes (as well as the deprivation of GSP plus, when one of his sidekicks Lady Aston sent a different response to the one anticipated by her peers in Brussels), and now his leaping into the fray with a tendentious and misleading article in the New York Times, he shows himself the most determined Death Eater of them all. He reminds me then of Peter Pettigrew, who betrayed his friends to keep in with Lord Voldemort, who turned himself into a rat to escape justice, and then when back in human form cut off his arm to ensure the return of the Dark Lord. I hope nothing quite so bad happens to Mr Miliband. But I suspect he has forgotten, if he ever knew it, that Voldemort means a wish for death, and that the destruction terrorists can perpetrate on body and soul are immeasurable. We have to hope then that this motley crew do not succeed. India I believe has destroyed its own horcrux, in line with the destruction of Voldemort’s Diary in Harry Potter and the Chamber of Secrets. Despite the efforts of LTTE sympathizers to revive LTTE support in the South, I believe the Indian government will not allow terrorism to flourish again, as opposed to support for the Tamil population. But elsewhere the residue of the terrorist movement lives on. We need to identify those elements that give it strength, and prevent their support from creating more suffering, and death and destruction, for this country that needs peace, for the world that could do without covert and overt encouragement of the Dark Lords of Terror.